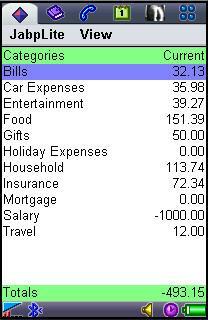 JabpLite is a personal finance program. JabpLite comes with a sister program JabpBT, which allows smartphones running MIDP 2.0 to exchange data with a PC via Bluetooth. 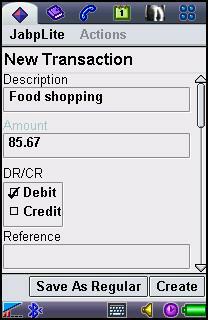 You can import or export QIF files to work with other PC-based financial programs. You can also backup your data and, when the time comes, move it onto your next phone! Now it can synchronize with JABP using JabpSync. · An update to the Quick Start feature which reduces the number of required keypresses on supported devices (including Android). 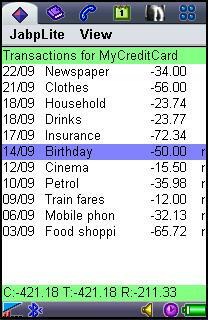 Quick Start is useful for recording new transactions on-the-fly without needing to enter the main program. · This release fixes a bug with the Purge process. · A number of bugs have been fixed. · This version implements a new preference Auto Backup On Exit, which automatically creates a JabpLite.dat file when closing the program. This works best on Android devices because they don't prompt the user when writing to memory card. 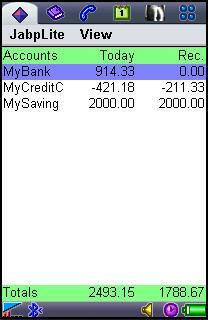 A bug with Running Totals in the Transaction View is fixed. · The mobile version implements 'drag-to-scroll' in the main views. A new one-touch menu system is introduced for touch-screen devices which reduces the number of keys pressed and speeds up navigation. To turn this on, go to Extra Options > Preferences > Use Canvas Menu and set option to Yes. · A bug-fix release which prevents JabpLite from crashing when going to background on Android devices and also fixes problem with transfers when importing data files. · This update allows special account types to be created and provides more information about category balances using the Show Category function. · This version implements a user request to select multiple accounts when using the Find function. A bug which could cause the Future Balance calculation to fall over is now fixed. · JabpLite version 1.69 fixes some minor bugs. 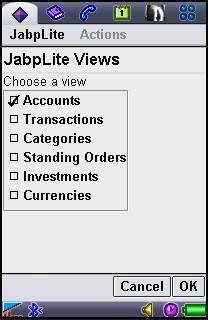 An update for JabpLite which includes an income & expense report in CSV or TAB format which can be imported into any spreadsheet program for analysis, graphing etc. A further update to make JabpLite more 'finger-friendly' for touch-screen devices with capacitive displays. A new Preference is included called Line Spacing which changes the spacing of items displayed on the screen. Set Line Spacing to (for example) 10 to make items easier to select with your finger. My Mobile 302 is askin me any time i want to enter internet service a question which is conflicting applications show items? so please how do i solve this problem?